Now, I’m not instructing you to do this, but rather citing number 23 of my 30 before 30 list. Yes, ladies and gentlemen, I have completed another item off the wonderous list and gotten myself another pair of glasses. During my 25 before 25 list I purchased these bad boys, though now that I’m a little older, and a little wiser sillier I went and got a pair of glasses to make sure my outward appearance reflected my inner person. That, or I got a wicked bad eye infection and was advised not to wear contact lenses for about two months. So I figured I’d take the chance to update my eyewear. I had actually been thinking about doing it for a while, getting new glasses that is, not getting an eye infection. The timing really couldn’t have been better. All my life’s goals are being achieved here. Categories: 30 before 30, Humor, Life | Tags: 25 before 25, 30 before 30, black rims, doin' it, glasses, older, sillier, smart, smart-looking, sun glasses, wiser | Permalink. Have you seen this movie? It. Is. So. Awesome. 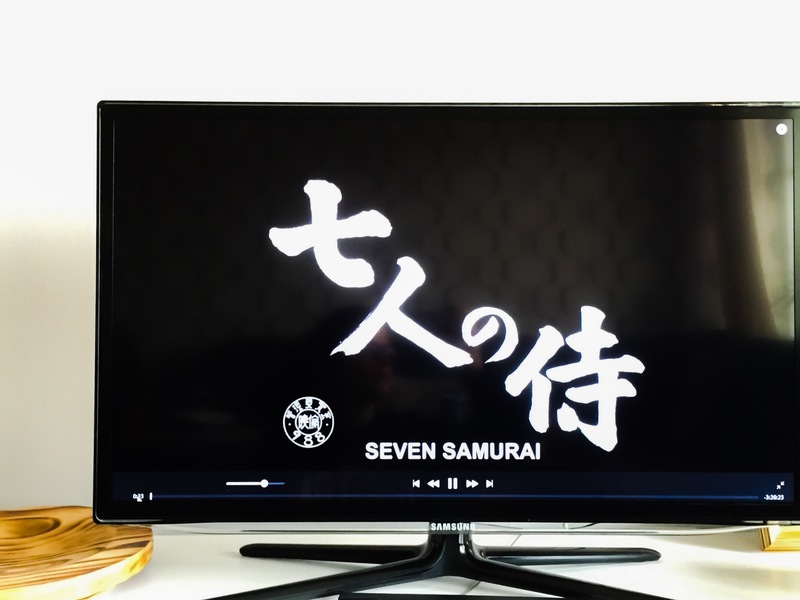 I had never seen a movie actually in Japanese, with subtitles and everything. Man am I glad I started with this one. It’s from IMDb’s top 250 list that I’ve talked about before. Here are my thoughts on the movie, of course without giving away any spoilers, because you guys gotta go see this one for yourselves! I had no idea all Japanese men bald in the exact same pattern. Apparently even very early in life. The farmers were sitting in the so-called third world squat – which is interesting because it’s discussed in the weight lifting world as the go to for form improvements. Those farmers could probably learn to squat a lot, and fast! It was very thoughtful of the sound editors to always play chirping birds during the daytime and hooting owls during the night-time – so the viewers wouldn’t get confused. Even bears come down from the mountains when they’re hungry. A true samurai won’t get hit. Won’t fall for that trick again, eh? You may be wondering about that last quote, doesn’t seem particularly zen or samurai-like. I just thought it was hilarious that it was apparently Canadians who translated the Japanese. Eh? Now, go watch. This movie was so good. Categories: 25 Before 25, 30 before 30, Entertainment, Life | Tags: 25 before 25, 30 before 30, entertainment, fun, IMDB, IMDB top 250, movie, movies, watch, watching | Permalink. Guys, it’s time to celebrate! I have finally done it! The lasagna to rule all lasagnas. That’s right, it’s a dessert lasagna. It’s a magical chocolatey treat, that Evelina truly does enjoy. Time to officially check off number 15 on my 25 before 25 list (moved over to my 30 before 30 list). Seriously guys, I’m so stoked to tell you about this lasagna. 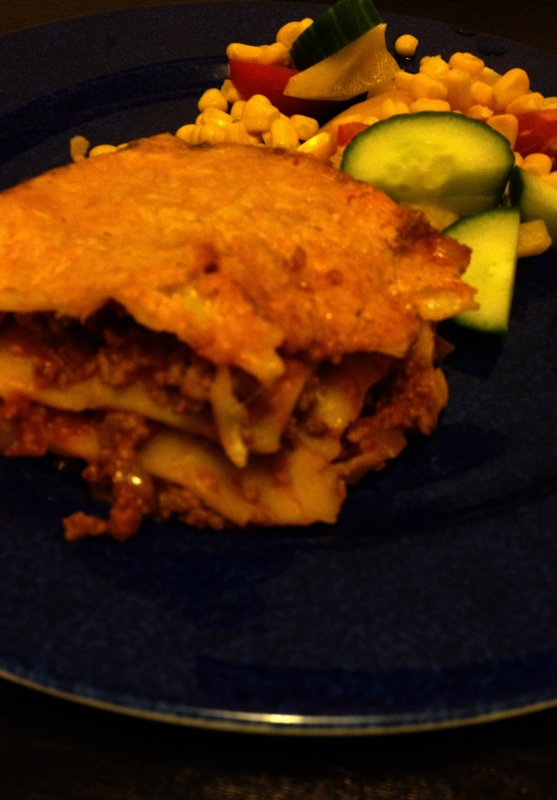 While this may not be quite as nutritional as the latest recipes I’ve posted, this lasagna is truly good for the soul. I originally saw this recipe on a friend’s Facebook, but when I went back to try to find it, it was long gone. So I just Google searched a recipe, but ended up changing it considerably. This is what I did. Using a dull knife cut the Oreo cookies in half, then slide the cream off. 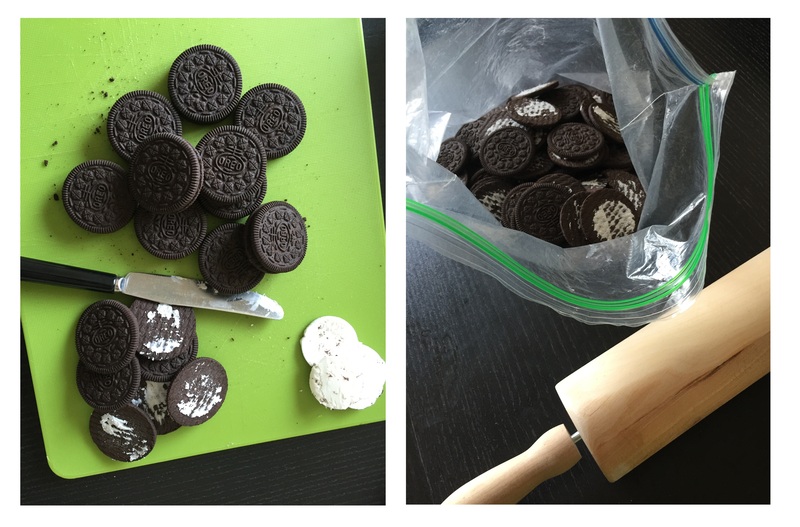 Place the Oreo cookies in a closable plastic bag, saving the cream centers for later. Crush the cookies with a rollingpin. You can also use a food processor, but seeing as we don’t have one I opted for the rollingpin method. You’re looking for fine crumbs. In a 9×13 in pan empty in the Oreo crumbs and combine with melted butter. Using a fork, mix the Oreo crumbs and butter evenly. With the fork push the Oreo and butter mixture firmly and evenly across the bottom of the pan. Place pan in refrigerator while preparing the next layer. In a large bowl whip 5 dl whipping cream. 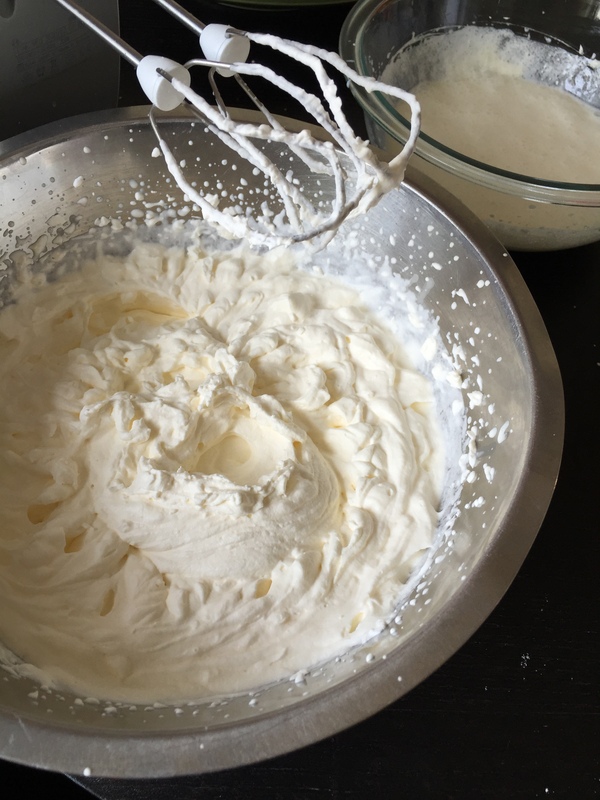 In a medium bowl use a hand mixer to mix the cream cheese and 2 tbs milk until fluffy. Then add the sugar and 1 & 1/4 cups whipped cream. Mix well. 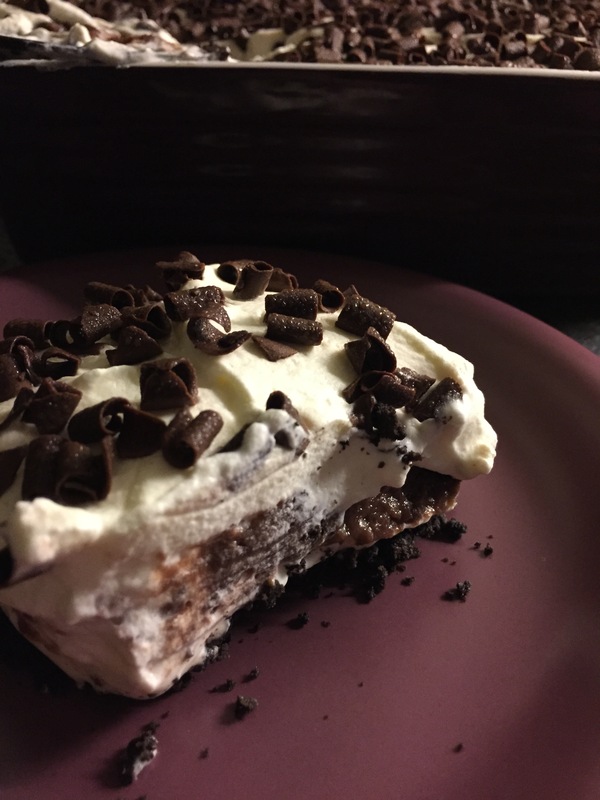 Spread this layer over the Oreo crust. 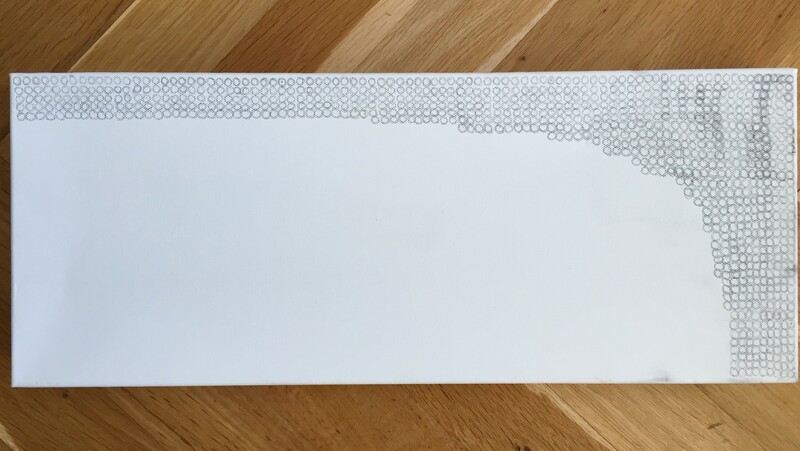 Return to refrigerator between layers. In a medium bowl prepare chocolate pudding according to package instructions, I used 5 dl cold milk whisked into the chocolate pudding mix. Place the pudding in the refrigerator for 1-2 minutes. Or leave at room temperature for up to 5 minutes. Spread the slightly chilled chocolate pudding over the cream cheese mixture. 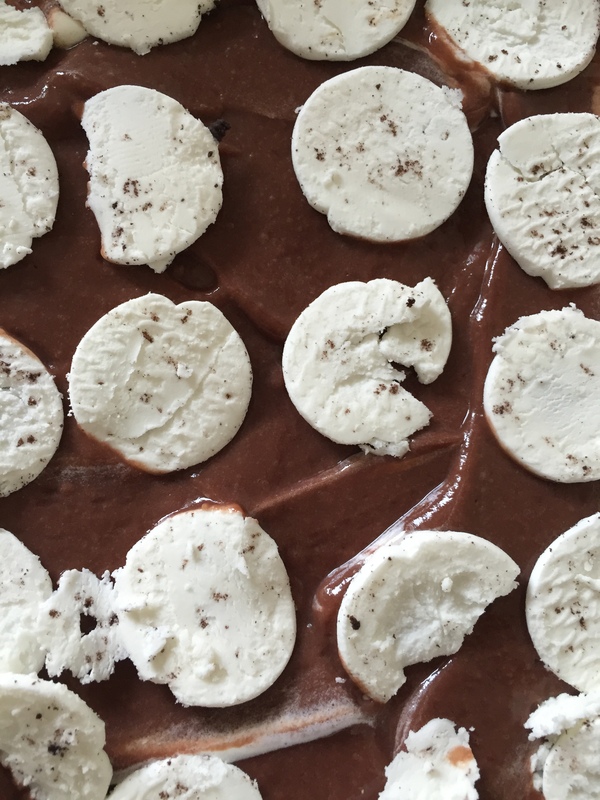 Carefully place the Oreo cream centers on top of the chocolate pudding layer and return to refrigerator for -10 minutes to allow pudding to solidify. 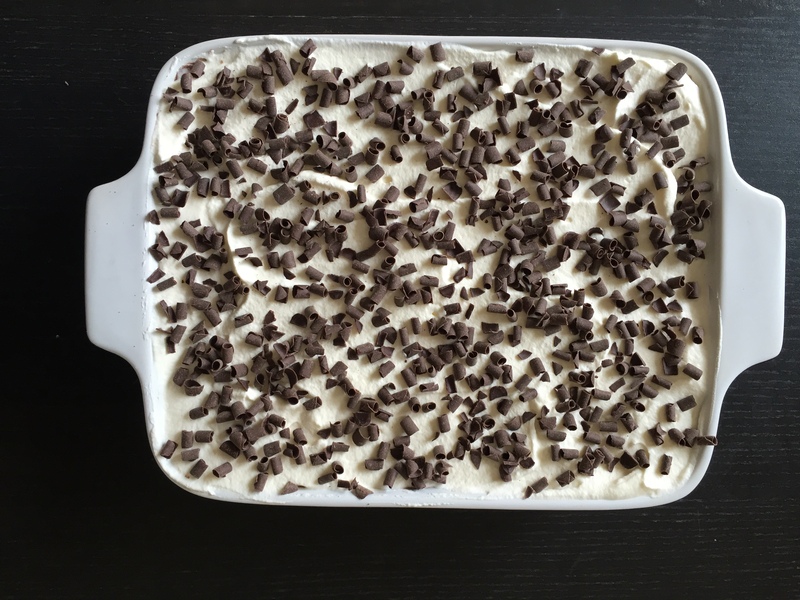 Spread the remaining whipped cream as the top layer, and decorate with chocolate pieces. Best served after being chilled for an additional 30-45 minutes. This dessert comes highly recommended, let me know if you try it out! Categories: 25 Before 25, 30 before 30, Cooking, Food, Humor, Life | Tags: 25 before 25, 30 before 30, bake, chocolate, complete, cook, cookies, dessert, eat, finally did it, food, goals, lasagna, Oreos, pudding, tasty, whipped cream, yum | Permalink.